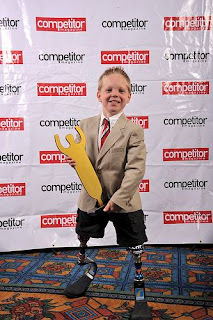 At least night's Endurance Sports Award, Cody MacCasland, an eight-year-old double-amputee, was honored as Challenged Athlete of the Year. My brother and husband were with me last night, and afterwards I asked whether they felt just a little lazy after hearing Cody's story. They confessed that they did. I did, too, and I've done two half ironmans. I've decided to do a third, but it doesn't seem like nearly the undertaking that any Challenged Athlete might accept. I'm reminded of Hey Nostradamus!, where the protagonist, speaking from the dead, recounts a perfect evening where he stripped down and ran exultant circles through his neighborhood. He declares something like, "I wish that I could've run naked through the streets every day of my life." I'm not suggesting that anyone, physically challenged or not, break laws of decency. But perhaps a little more metaphorical streaking, and a little less status quo, would do us all good. I'm sure if you ask Cody if he is challenged he would say no. In fact his reply would be, "Hey I have less weight to carry". Challenges are what we bring upon ourselves. Accomplishments are what we do every day. I look at each day as an accomplishment and enjoy every minute I can. Looking forward to cheering you on to your 3rd half ironman. You Go Girl! I hope you'll be drinking mai tais when I ride and run by!